To fully explore Marie-Galante, renting a vehicle is recommended. The roads are good but the lack of clear signage can make for some unexpected (and often delightful) detours. Several of the major international car rental companies as well as a number of local companies operate on the island. Driving is on the right. A valid drivers license is required. Because of its relatively flat terrain and limited traffic, getting around on two wheels in Marie-Galante is not as difficult as in some other islands. If you choose to travel by scooter, French law dictates that a helmet (casque) be worn and a motorbike or driver's license will be required. Please click here for a directory of scooter and bicycle rental companies. 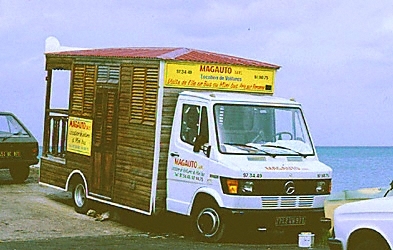 There are taxis available as well as daytime bus service between the main towns of Grand-Bourg, Saint-Louis and Capesterre.